Keeping your security solutions up-to-date & compliant! Vital fire and security systems will function correctly when they are needed. The number of faults and duration of down times are minimised. High levels of performance are preserved. Engineer on call 24 hour 7 days a week. Value for money by ensuring equipment has a longer working life. You are in full compliance with your Insurance requirements in accordance with the EN-50131 European standards and the Garda policy on monitored alarms. Computer diagnostics where our technicians can log onto your alarm system at your request to make urgent adjustments, change key holder codes or view and print the system log for your convenience. 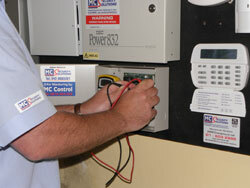 MC Security Solutions offers a choice of three service and maintenance agreements to meet most customers requirements, Maintenance Lite, Preventative Maintenance and Comprehensive Maintenance. Agreements are tailored to meet the precise needs of individual customers; covering any special circumstances, operating conditions and available budgets. Comprehensive Maintenance. A full extended warranty service to cover all replacement parts and all call out and labour charges. The Preventative maintenance programme is also included. Our technicians are equipped with the very latest technology and with our advanced tracking system we can track the location and availability of all our on-duty technicians, matching their individual skills and training with the specifications of your system to ensure that you receive the expertise you need. We ensure that emergency assistance is always close by, Many emergency calls can be remotely accessed within minutes by our remote diagnostics system and where necessary we aim to attend within four hours and often arrive sooner. All systems, on installation are fully compliant and are certified to NSAI IS-EN 50131 standards for 12 months. Following that your system becomes non-compliant without the minimum of a preventative maintenance procedure been put in place.